Hoya is a common houseplant, but this tricolor variety takes it to a whole new level! The large, shiny green leaves are trimmed in blush-pink and white. It grows with a vining, cascading habit that makes it look really lovely trailing over the edge of a shelf. 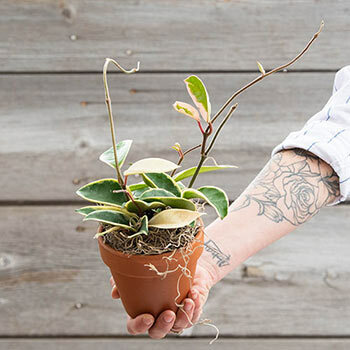 This low-maintenance houseplant will grow anywhere, no matter the lighting conditions (or lack thereof)—but to see its globe-shaped clusters of tiny white flowers bloom, keep it in some sunlight. It blooms only sporadically, but it's always such a wonderful surprise. Hoya is a cinch to grow, and really only needs watering once the soil is nearly dry. It's such a great housewarming gift for apartment dwellers. The stylish look will keep their new place looking fresh, while its minimal care and lighting needs will make success easy. Bloom Time Blooms randomly from late spring through early fall. It will not bloom if it does not receive enough light. Foliage Type: Long tendrils with green leaves. The leaves are variegated with a white trim. Bloom Time: Blooms randomly from late spring through early fall. It will not bloom if it does not receive enough light. Pruning: Prune when leaves appear to be damaged, wilted, or dead. Avoid trimming the bloom spurs as they will not regrow until the next growing season. 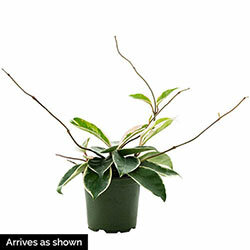 Winter Care: Move the hoya to an area with more indirect sunlight. Lower the frequency of watering. Additional Information: Nontoxic to pets, but it can make them sick if they eat enough of the plant. Anyone with a latex allergy should not handle the plant if it is damaged.